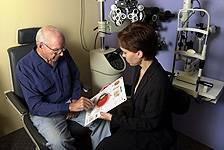 Just about everyone will have a need for vision correction at some point during their lives – especially later in life, when reading small type becomes more difficult. By understanding the most common vision conditions, you’ll know what vision condition you have and how this condition can be corrected with contact lenses. Hyperopia, or farsightedness, is a common vision condition where you are able to clearly see objects that are far away, but objects close up are blurry. Myopia, or nearsightedness, is a condition where the eye sees near objects within a certain range very clearly while distance vision appears blurry at all times.